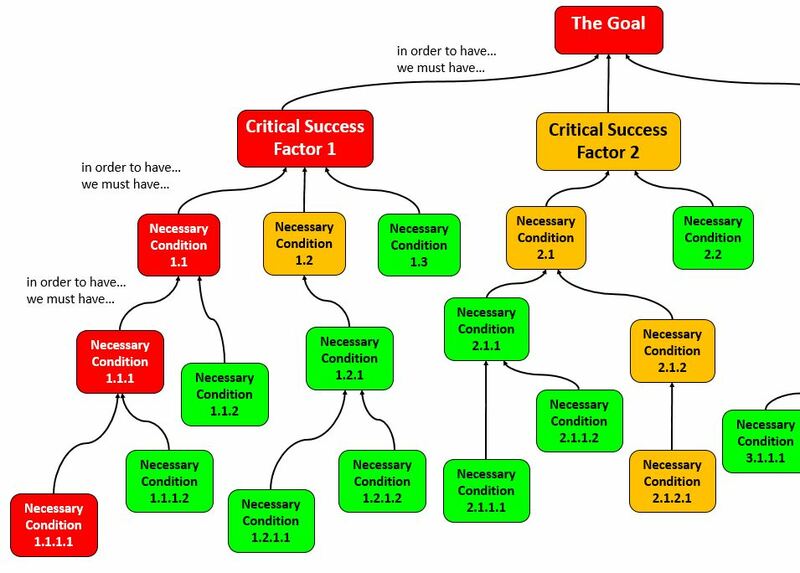 A Goal Tree, sometimes still referred to as Intermediate Objective Map or IO Map, is primarily a Logical Thinking Process tool, itself linked to the Theory of Constraints. The top of the tree deals with strategic planning while going down to its bottom links strategy to operations. The very top of the tree holds the Goal, the purpose, the vision. A unique box holds the concise “mission statement”, or the “why” this system exists. On the next level, three to maximum five Critical Success Factors (CSF) are top objectives that are mandatory to achieve in order to achieve the Goal. Under each CSF a variable number of Necessary Conditions (NCs) are found. As for the Goal with CSF, NCs are conditions that must be fulfilled in order to achieve the CSF. NCs may then flourish to the details, each upper level NC being conditioned by lower level NCs, and so on. 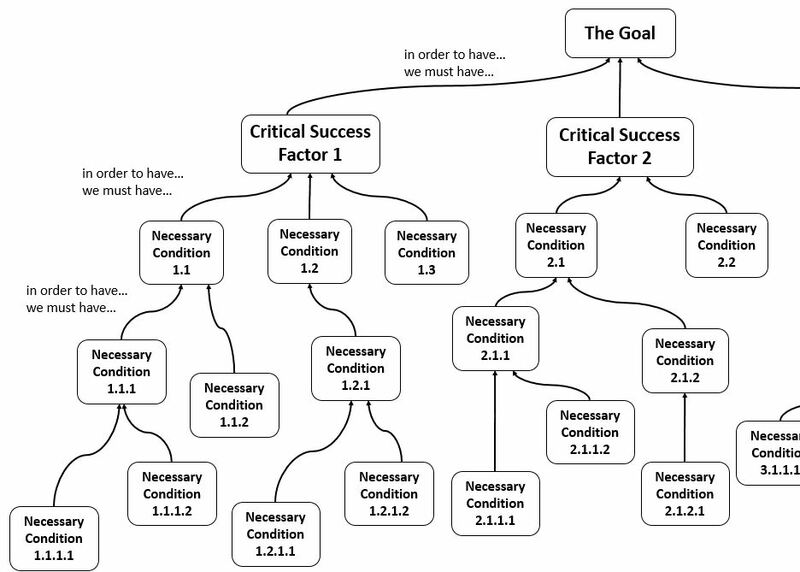 A Goal Tree is built on necessity logic-based relationship that reads “in order to have…(upper objective) we must have…(lower condition)”, thus building a Goal Tree is straightforward. Experience soon tells that Critical Success Factors (CSF) must be limited to five maximum (recommended). One good reason for this is for top management to keep overview with a limited set of really Critical Factors. If achieving the goal is related to a vast number of CSF, the goal might not be well stated or the venture likely to fail. The second reason is that it’s easy to mismatch a Necessary Condition with a CSF. Therefore, keeping the number of CSF very limited forces the tree builders to check carefully every box. Further explanations about building a Goal Tree can be found in William Dettmer’s publications. A Logical Future State Map: as the Goal can only be achieved when all Necessary Conditions are fulfilled, and these obviously aren’t met by the time the Tree is built, the Goal Tree is a glimpse of the future state. A benchmark and an actual situation Map: a Goal Tree is a benchmark against which to assess the current condition. When gaps between actual and future state are marked on the Tree, the Goal Tree turns into a snapshot of the current situation. A Road Map: With gaps identified and a clear view of what to achieve in order to achieve the Goal, the Goal Tree becomes a kind of road map. Let’s explore the above points 2 and 3 somewhat more in detail. While depicting the Future State is the prime usage of the Goal Tree, depicting on the same Tree the actual situation is a personal interpretation, probably shared with many of those exposed to the Goal Tree. Once the Tree completed, it is meaningful to color each box with the 3 Green / Amber / Red colors, according the completion and mastery of the box content. Example: if one Necessary Condition states “we must keep our Overall Equipment Effectiveness (OEE) over 80%” and the actual performance is only 65% at best, the box should be colored Red. If OEE is in the 75-80% range, the box may turn Amber. Once steadily over 80%, it turns Green. This color code is immediately understandable and makes the Goal Tree fit for visual management. The “rule of colors” states that an upper box takes the color of the worst case of Necessary Conditions underneath. If one NC is Amber, the upper level is Amber, if one NC is Red, the upper level turns Red. The color code makes the Goal Tree a road map as Amber and Red boxes are to be turned Green in order to achieve the Goal. This is a way to focus the efforts and limited resources to the spots to improve mandatorily, consistently with Theory of Constraints precepts. Over time, the colors on the Goal Tree should be changed according to improvements and issues solving. The Goal Tree starts with autumnal colors and goes green over time. One practical hint: keep the original colored Goal Tree as it is as a reference and use a copy to display the change in color. In this way, displaying the original and actual trees next to each others, the changes are made visible. The Goal Trees used in such a matter find their places in the Obeya or Operations Room. Hello. First I want to congratulate you for another excellent article. Just a curiosity: with the color system you mentioned in the text above, if a higher-level entity inherits the color from the worst of it’s lower level, then the NC1.2 (from the image) should not be green instead of amber? Thank you Sergio for pointing out this apparent mistake. At least you’ve demonstrated your Tree-scrutinizing skills! Yet the Goal Tree is not a cause-and-effect logic tree, but is necessity-based.